In this boy-dominated batch of new baseball books, there are picture books and middle grade novels, action packed stories and baseball history, team spirit and individual courage. So, if your in-house sluggers are baseball crazy, try pitching one of these dozen new books to them. They just might hit a home run. 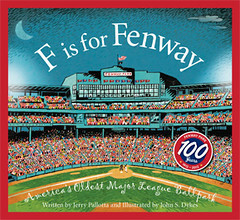 In celebration of Fenway Park’s 100-year anniversary, this A-Z picture book introduces historic and nostalgic facts about America’s oldest major league ballpark. Readers can learn about the green monster, Peskys Pole, the lone red seat, and the long-standing Yankees rivalry. Red Sox fans will want this one in their collection. A collection of poems that takes ball lovers through the game and introduces them to the players on the field. From “Warm Up” to “The Season Is Over,” Florian pitches perfect in his newest book of poetry. The amazing true story of the Acerra family, who had sixteen children, twelve of them boys who all played baseball and who made up their very own baseball team. 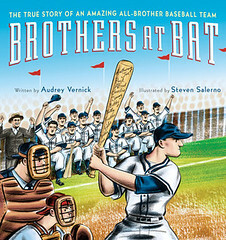 Set in New Jersey, from the 1920s through the 1950s, this picture book follows the brothers from boys playing ball after school to serious players forming their own semi-pro team to soldiers in World War II to their induction in the Baseball Hall of Fame. Their story exemplifies true team spirit. Luis, a baseball loving and somewhat superstitious rabbit, believes the free food samples he tries at the market gives him good luck in his games. But when the food samples run out, so does his luck on the baseball field. In the bottom of the ninth inning with two outs, Luis is up to bat. Will he let go of his superstitions and remember what his coach taught him before he strikes out? In this picture book by local children’s book greats, Diane deGroat and Shelley Rotner, it’s the neighborhood dogs who take to the field. While the humans sleep, the Doggers take on the Hounds for the championship. 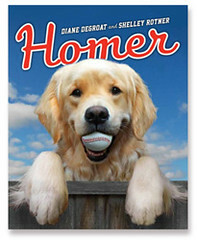 Can Homer hit it out of the ballpark to lead the Doggers to victory? Short, simple text and photographic images that put an array of canines in uniform will have young sluggers cheering. It’s 1948, in Cleveland, Ohio, and Homer and his father are buzzing with excitement. Their team, the Cleveland Indians, has made it to the World Series, and they’re rooting for Larry Doby, the first African-American player in the American League. In this exciting game, Doby not only helps the Indians win their first World Series in 28 years, but breaks the color barrier in baseball and helps lay the foundation for the civil rights movement. It’s 1935, and 12-year old Nick has just been released from the hospital after a bout with polio. Once the best pitcher in the league, he now wears a brace and will never walk the same again. 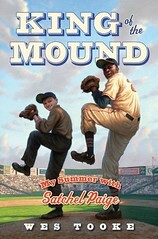 But meeting Satchel Paige, the best pitcher in the world, who has been locked out of the major leagues because of his skin color, shows Nick he can overcome his obstacles and get back on the mound. Being the new kid in Baltimore and a bit “burly” has made life for 13-year old Cody Parker a bit difficult. Throw in the fact that he’s competing for the starting job on the baseball team against a young hoodlum and that a string of mysterious thefts has plagued his middle school, and life gets even more complicated. Can he find his place on the team and get people to see through his size to his talent? 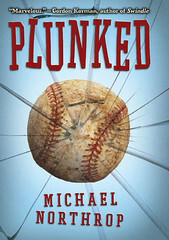 Set in post-World War II Montana, 11-year old Donald is humiliated when he is knocked out by a pop fly in left field. Not only is most of his town watching, but his team loses the game. As he tries to redeem himself through a series of committed but laughingly, disastrous efforts at becoming a star athlete, he shows just how much heart he has. Sixth grader, Jack Morgan, is at the top of his game. His batting is strong, he has a chance at the starting spot in Little League, and he’s getting up his nerve to talk to his team’s talented shortstop, Katie. But when he’s hit by a stray fastball, his world comes undone. And he must dig deep within himself to overcome his fear and get back in the game. Written in vignettes, and set in the 1940s, this book tells the story of 12-year old Tetsu Kishi and his family who have been sent to a Japanese internment camp in the middle of the Arizona desert. When someone builds a baseball diamond and recruits a camp team, Tetsu is excited to pull out his glove and get back in the game. But when his sister becomes gravely ill, Tetsu feels responsible and must weigh his love of ball against his love of family. 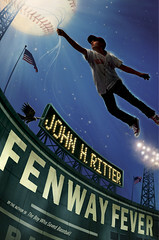 The story takes place in Boston, 2012, the one hundred year anniversary of Fenway Park. 12-year old Alfredo “Stats” Pagano helps his family run a hot dog stand outside the ballpark. But the season is not going well for the Red Sox nor for the Stats’ s family business, and there’s murmur that the Curse of the Bambino has returned. Stats teams up with Red Sox pitcher Billie Orbitt to break the possible curse, and what happens next is magical. “Little League Heroes” by Joe Jackson is another baseball book for boys. He hears the “hey batta batta” as the story comes alive while reading. I’d also add Summerland by Michael Chabon as a great read-aloud. It’s a bit sprawling, but it uses the magic of baseball with Tall Tales and parallel worlds, and more.